I can’t believe it’s October already! The months are flying by this year. One of my favorite things about October is the fall weather and Pumpkins. I think pumpkins are beautiful… and they taste good too! We recently started incorporating more of a Paleo type diet into our lives and one thing that we were all missing was baked goods. I love a good muffin and this time of year, especially a pumpkin spice one so I decided to make one. 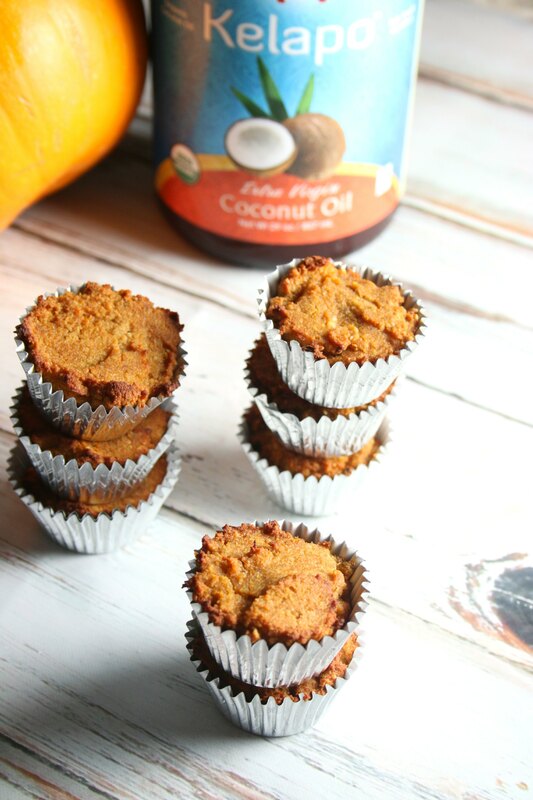 When they came out of the oven they were even better than I expected and tasted more like pumpkin pie than a muffin so I immediately knew I had to call these Paleo Pumpkin Pie Bites. The real test came when I had the rest of my family try them. They loved them too! They freeze well too so you can make a big batch of them and then thaw them out as needed. My husband and daughter took them with them to the gym and had them as an after workout treat. I love the subtle coconut flavor. It has a slight tropical taste that adds more depth. 1. Add all wet ingredients to a bowl stir. 4. Add a heaping spoonful of batter to each muffin liner. 5. Bake for 15-20 min at 350 degrees or until the batter is lightly brown and bounces back when you push on it. The batter is not too watery. It is pretty thick and not too wet like a normal batter so don’t let that worry you. These keep for about 2 days if refrigerated. After that they get too dry to eat, or at least too dry for my liking.